Much has been written on the three cyclists tragically killed in collisions with lorries on London’s roads so far this year. Terrible though they are, these are by no means extraordinary. Indeed, perhaps because the death rate in 2010 looks as though it will be no different to that of years past, action is even more urgently needed. 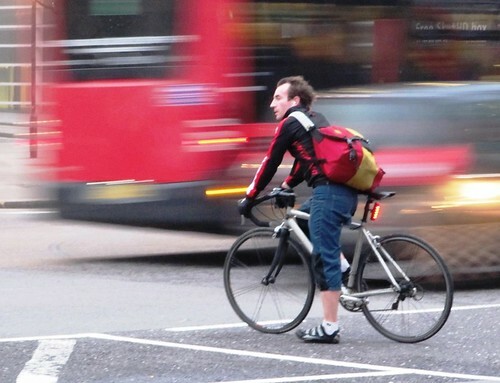 Collisions with HGVs were the cause of 69% of London’s cyclist deaths last year. In 2008 this figure was 88%. There can be no doubt that lorries are the primary source of cyclist’s deaths in London. "Primary prevention of accidents involving cyclists could be achieved by reducing dangers from high risk vehicles"
"In inner London, in relation to their traffic volume, HGVs are estimated to cause 30 times as many cyclists deaths as cars and five times as many as buses. Until the factors leading to this excess risk are understood, a ban on HGVs in urban areas should be considered." And there’s our problem. 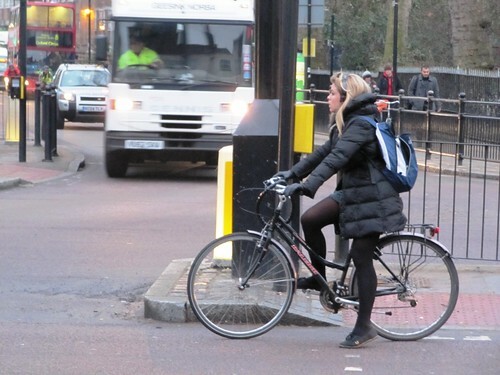 Whilst cyclists should, of course, take as much responsibility for their own safety as possible, the entire onus seems to have been placed solely on the shoulders of the most vulnerable road user by safety campaigns seeking to solve this problem. Much has been written about how cyclists can limit their exposure to risk (see my advice here) and the message has been out there for some time now. Haulage operators are apparently fitting more mirrors and some have installed side impact warning sensors. But despite this, still the deaths are occurring: the death rate for cyclists killed by lorries have remained tragically high and tragically steady for many years now. Some have tried to capitalise on the rise in new cyclists on our roads as a satisfactory excuse for the death rate, and yet many of those killed have been shown to be highly experienced riders. Indeed, of the 8 cycle couriers known to have died whilst working in London ALL have been killed by heavy goods vehicles of some sort; these are possibly some of the most experienced riders on our roads. Others still have spoken at how the very design of lorries means they are inherently difficult to see cyclists from; that despite the driver doing all of the right things they had no chance of even seeing a cyclist before they run them over. This idea that lorries are difficult to use in urban environments by their very design, regardless of the driver’s intentions, is unsatisfactory (and there have been well publicised cases of cyclists being killed not because they weren’t seen but because the driver of the truck failed to even look. Emma Foa springs to mind; decked out in high vis and a helmet and sitting in the Advanced Stop Line waiting for the lights to turn to green, she was killed by a lorry driven by a man who was too busy looking through his time-sheets and paperwork to even deign to look in his mirrors as he turned across and over the top of her. He would later be fined just £300 and be allowed to keep his license). Unbeknown to many is that there is a ban on lorries in London at certain times: the “London Lorry Control Scheme” was set up in 1985 to address noise pollution concerns. It bans HGVs from operating in central London and other densely populated areas on the outskirts from 9PM to 7AM Monday to Friday, 1PM to midnight on Saturdays and not at all on Sundays. Whilst concerns about noise pollution are of course valid, it seems ludicrous in the extreme that this very scheme encourages lorries to come roaring out of their yards fully laden with goods, dashing to make their first delivery, into the morning rush hour peak: the very time when the most cyclists are making their way to work, children are walking to school and people are waiting at bus stops. Perhaps, if lorries are the largest cause of cyclist’s deaths and serious injuries, this can explain why most of those deaths and injuries occur in the AM peak? We’ve seen that fitting safety mirrors to lorries, and telling cyclists to not follow cycle paths past lorries to the ASL have had no effect on the death statistics. Unless we want to continue repeating this abhorrent macabre pattern it’s time that more radical thinking took place and the onus for vulnerable road user’s safety was placed on the operators of the cause of the casualties. The Met Police, our cycling campaigns, the Mayor and the haulage industry must go back to the drawing board as a matter of priority and push for the lorry ban to be amended to include the peak hours. The legislation is in place and just needs to be changed, the recommendations are there from the British Medical Journal, and the statistics speak for themselves: our ‘powers that be’ just need to grow some balls on this issue and do something about it. Otherwise the inevitable can only continue to happen. I know that many of you are extremely concerned about the volume of cyclist deaths; too many of us are thinking “There but for the grace of God go I”. I know that many of you, especially touched by the recent deaths, want to see urgent action on this issue. We need to keep the heat turned up on this issue in order for it to become a priority, and for that reason I call upon you all to come to this Friday’s Critical Mass. I understand that this Friday will not be your ‘usual’ Critical Mass and there are plans afoot for it to visit the sites where the three cyclists were killed this year. I know that many cyclists have an antithetical relationship with Critical Mass but as a ride with no leaders and no chosen route it is what it becomes by the virtue of the people who attend. It's the best tool we have for getting cyclists in the same place at the same time saying the same thing and is what we make it by being on it; I'll be there on Friday and if you care about cycling I would encourage you to be there too. It’s time for positive action, before another cyclist is killed. Critical Mass: Critical Mass is held on the last Friday of every month. It has no official organiser and no pre-designated route and cyclists of all abilities and backgrounds are welcome. Meet outside the BFI, beneath Waterloo Bridge, this Friday the 26th March from 6.00PM. a long but worthwhile post mark. thanks for putting it all out there in black and white, the current system does indeed seem really stupid. i'll be there at critical mass, hope many others will be too? I cycle in London every day Mark and I agree with you that TFL/the Mayor should do more to ensure that dodgy trucks and their drivers are restricted, esp. at key times of the day. The fact that HGVs only make up 6% of traffic but cause around two thirds of cyclists' deaths is an especially striking point. I wrote here http://bit.ly/4aw23H about the death of Eilidh Cairns in Notting Hill - it made me think about how much we need genuinely ambitious plans for reshaping the traffic in London. Of course I am absolutely open to all other ideas of campaigning, but we've tried letter writing, lobbying etc etc - maybe it's time that cyclists spoke up for themselves? An excellent article. I wonder though what the death toll will have to be before society changes it attitude? I feel that the status quo will always be in the favour of motorised vehicles and, other than symbolic gestures, nothing of substance will be done. The present cycle lanes are a joke as they are ill conceived and go ignored by motorists. Having been on several critical mass rides I have witnessed dozens of ugly scenes, mainly initiated by drives who feel that cyclist don't have a legitimate place on our roads if it causes the motorist any delays. As long as we stay in the gutter then we can be ignored. Lorry and car drivers will continue to make mistakes due to human error and negligence. This will lead to more fatalities. The only way to reduce accidents is to create the infrastructure that negates this problem. I cycled in Copenhagen for 10 years. They have raised cycle lanes that are 1.8m wide. cycles have their own traffic lights and drivers are heavily penalised for any infringement of cyclist rights. Nobody parks in cycle lanes as their car will be towed within an hour or less if they do so. Until we see this radical reengineering of all our roads then the problem will persist. Let's face it, will 'the public' be happy that we reduce the car carrying capacity of our roads by over 50%? That will be unlikely to happen in the car-centric UK, especially with London't small roads. I dream that one day everyone wake up and start cycling on car-free roads lined with flowers with clean air and no noise. What will it take for this to happen? First up, I'm a cyclist, and I don't own a car. Could it be that one of the big issues here is ignorance on the part of some cyclists? The chances are that if you're reading this post, you are already aware of the dangers concerning left turning lorries, and hopefully doing everything possible to avoid this situation. Now I'm not suggesting it's all the fault of the cyclists, and I wish to express my condolences and sympathies to the relatives of all those who have died in this situation. I'd happily support a campaign for a law placing the burden of proof on motorists, so ruling out 'SMIDSY' as a defence. Clearly there is little you can do to avoid being knocked over if you are overtaken by a lorry which turns left. Having said all that, we have the road system we have. We have the HGV drivers we have. These things will change slowly, if at all. Yet frequently I see people cycling right into that blind spot danger zone. Recently I got a big load of verbal from another cyclist, called a "*!(!" and "inconsiderate to other cyclists". My crime? Not squeezing into a narrow gap between the railings and the 2 vehicles in front of me at a junction when the lights were clearly about to change. While we campaign to raise awareness amongst delivery drivers, let's make sure riders are aware too. Sorry that was a long comment. Ride safe. However, this message, and indeed the message to drivers has been 'out there' for some time now, and to no effect, and this is why I can't help but feel that something a little more radical is needed. It's not an outright ban, just an amendment to existing legislation, surely it can't be that hard? I agree with James (and to reiterate: I don't own a car (but hold a driving licence) and I cycle every day). Naturally enough I harbour all sorts of dreams about the "Copenhagenization" of the towns and cities in the UK - but I do also admit that we should remain pragmatic about the roads as they currently are. 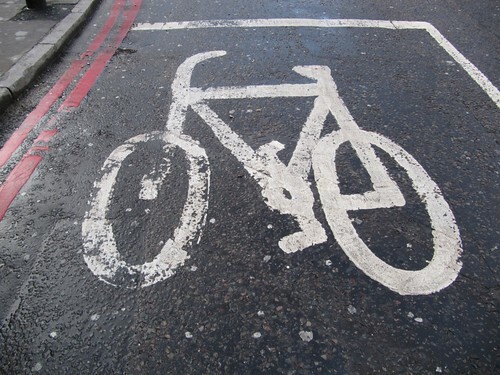 Gents, I share your passion for our urban centers to be 'Copenhagenized' - but I don't think JUST building infrastructure will fix everything; we need to get the law fixed, have cycle theft taken seriously, have cycle accidents involving vehicles taken seriously (£300 fine and points for killing someone, I mean FFS!) and deal with cycling's PR problem too - working on all these things will help redress the balance, and this particular 'campaign' about HGVs is just one part of it. The biggest reason non-cyclists don't cycle is because they are literally TERRIFIED of using the road. Remove the source of the majority of cyclist's deaths and you've gone a long way towards creating conditions within which TRUE mass cycling can take place. It's hard not to feel that they're not going to take much notice of cycling injuries and fatalities (17,064 and 104) when there's still such general carnage going on (222,000 'casualties', 2,222 fatalities). While illegal behaviour is still effectively condoned on the roads (Ranulph Fiennes gets 4 points and £1k for falling asleep at the wheel and maiming someone), things aren't going to change.